The Nikon Coolpix A is Nikon's new APS-C compact camera with a 28mm equivalent lens and a pocketable body, how does it perform and is it worth the premium price? 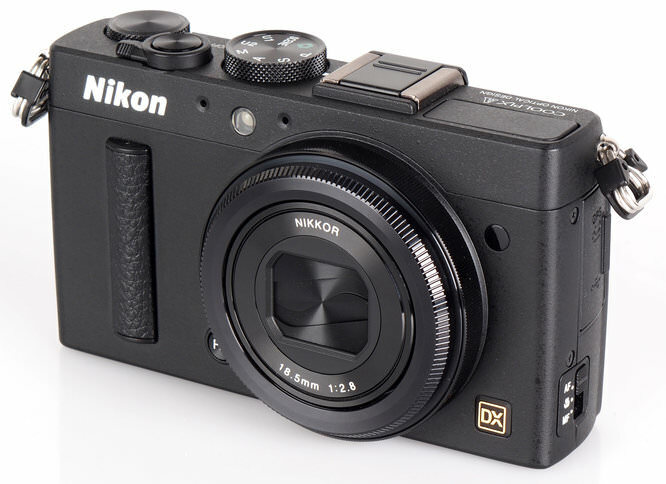 The Nikon Coolpix A is the new top of the range Coolpix camera from Nikon and joins a limited number of premium compacts with an APS-C sized sensor, featuring a 16.2 megapixel DX sensor from the Nikon D7000 Digital SLR. 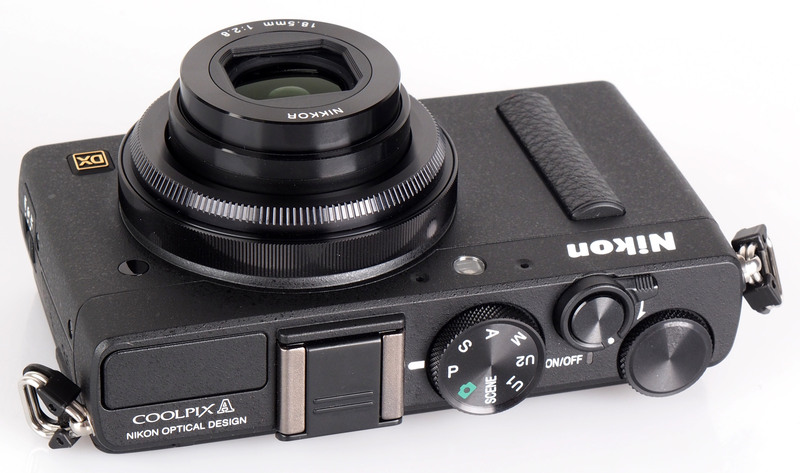 On the front is a 28mm equivalent f/2.8 wide-angle Nikkor lens, and emblazoned proudly on top of the camera is "Nikon optical design" as well as "Made in Japan". 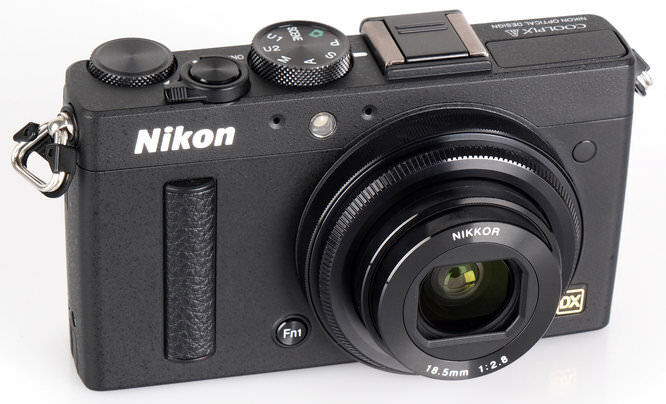 The Coolpix A features the 16.2 megapixel APS-C CMOS sensor from the Nikon D7000, a Nikkor 18.5mm f/2.8 lens that is equivalent to 28mm in 35mm film terms, as well as full manual controls, RAW shooting and full HD video. 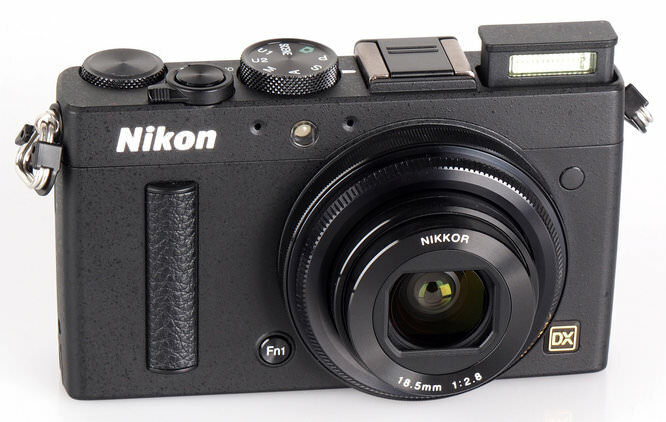 According to Nikon, the Nikon Coolpix A is the world's smallest camera to feature an APS-C sensor, being smaller than the Leica X2. The design of the camera is very stylish, and is available in black or titanium silver, with a metal body and it fits very nicely into pockets. A focus ring surrounds the lens, and a screw off front allows the use of accessories such as the optional lens hood, and an adapter that allows the use of 46mm filters. Optional accessories are available including an optical viewfinder (DF-CP1), and it is compatible with Nikon's DSLR accessories as well. An optional UR-E14 adaptor ring enables the use of 46mm lens filters, or there is an optional lens hood (HN-CP18). 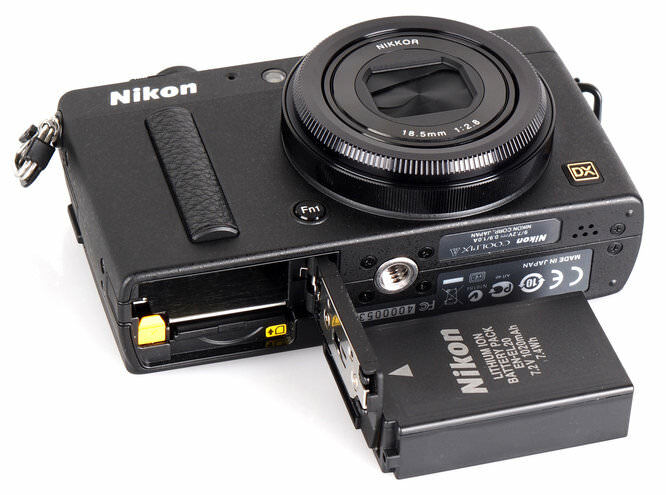 The Nikon Coolpix A is compatible with the WU-1a Wi-Fi dongle, as well as the optional GPS unit (GPS-1). With a 16 megapixel DX APS-C sized CMOS sensor, from the Nikon D7000, image quality should be very good, with excellent low light performance and the camera features an AF-assst light. Nikon has also removed the optical lowpass filter (OPLF), so detail and sharpness should be good as well. We were impressed by the results we saw from the camera. The camera is powered by a 1020mAh 7.2V lithium-ion battery. 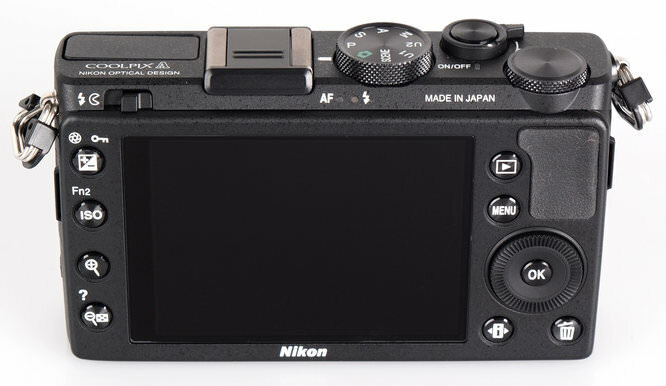 Handling - The compact metal bodied camera features a control layout similar to Nikon's Digital SLRs with buttons arranged to the left of the screen giving access to exposure compensation, ISO, as well as zoom control. The <i> button gives quick access to settings and controls on the rear screen. The locking memory and battery compartment is made out of plastic with metal on the inside making it feel solidly built. The focus ring surrounding the lens is made of solid metal and combined with the metal mode dial, switches and command wheel on the top of the camera gives the camera a premium feel and look. The front features a relatively large rubber grip, as well as a soft grip on the rear for your thumb making it easy to hold securely. The on/off switch surrounds the shutter release button and makes it quick and easy to switch the camera on/off, again giving the camera a tactile feel in use. The camera will fit into jeans pockets as well. The side switch lets you choose between manual focus, or autofocus, and in manual focus mode you can use the lens ring to focus smoothly. You can manually select the focus area, right to the edges as well as the very far corners. The manual focus ring is speed sensitive, and there is also a removable ring to allow adapters to be screwed on. Menus - The menus are the same as those found on the Nikon Digital SLRs, and spread over five screens, with colour coding, including playback (blue), shooting menu (green), setup (orange), retouch (purple) - which includes RAW processing, and a number of effects - the last menu option is the recent settings menu where the camera remembers your most recent settings. Anyone familiar with the Nikon Digital SLR menu system will be glad to see the same menus on the Nikon Coolpix A - which you can see in action on our YouTube channel. The camera also features the new <i> button to give quick access to options on the rear screen, and a number of buttons run along the left side of the monitor to provide quick access to ISO and exposure compensation. Battery - Battery life is rated at 230 shots according to Nikon / CIPA testing which is quite short, and for more extended shooting a second battery may be required. * Tested with AF-S, AF-F, Face Detection and Normal, and all the same speed. Shutter response is excellent, although focus speeds are quite slow, with these becoming even slower when using the macro focus mode. Switch on time, shot-to-shot and continuous shooting is good, with a good number of shots possible before the camera slows. Sample Photos - The camera delivers bright punchy images with excellent colour and detail. The camera can produce pleasing background blur when focused on subjects close to the camera, and the flash performs well, although the wide-angle isn't ideally suited to portrait photos. We will add additional photos shortly. Lens Performance - The lens is very sharp from f/2.8 and becomes sharper as you stop the lens down. The closest focus in macro mode or manual focus is 10cm from the front of the lens, and with a wide-angle lens, this doesn't let you get particularly close to your subject. Dynamic range is good, and can be extended by using the D-Lighting option in camera. Detail is very good, even into the corners, with slight purple fringing appearing in the far corners under areas of high contrast. Exposure is reliable and there is very little sign of barrel or pincushion distortion. ISO Noise Performance - The ISO range starts at ISO100 and goes all the way up to ISO6400, ISO12800, and ISO25600, with Nikon referring to ISO12800 at Hi 1.0 and ISO25600 as Hi 2.0. Noise is low up to ISO1600 with good detail, and at ISO3200 detail starts to disappear slightly as the level of noise increases. At ISO6400 noise increases and the loss of detail is more noticeable, and at ISO12800 noise is at the highest levels and it's at this setting that you may need to process the RAW file or resize the image. White Balance Performance - Auto White Balance (AWB) performs reasonably well under tungsten lighting with a warm result. The tungsten preset gives a slight green image. AWB performs very well under fluorescent lighting with the fluorescent preset giving a magenta cast. For more accurate results the white balance can be altered, or manual white balance can be used. Panorama mode - The camera doesn't feature a panoramic mode, so I've used Photoshop to merge the photos together. Digital Filters - The camera has a number of scene modes and effects, including: portrait, landscape, child, sports, cluse-up, night portrait, night landscape, party/indoor, beach/snow, sunset, dusk/dawn, pet portrait, candlelight, blossom, autumn colours, food, silhouette, high key, and low key. As well as this, the camera has colour options available that let you set sharpness, contrast, brightness, saturation and hue. Video - Video options include Full HD or 720p resolution video at 30/25 or 24fps, as well as high or low quality recording. You can also set the ISO speed up to ISO6400 in manual mode, as well as the aperture and shutter speed. Unfortunately there is no setting for wind-filter which may have helped with the video below. Alternatives to look at include the Fujifilm X100 / X100s (both with 35mm f/2 equivalent, optical/electronic viewfinder, X100 available for £549, X100s £1099), Leica X2 (35mm f/2.8 equivalent, £1499), Sigma DP1 Merrill has the same 28mm equivalent focal length and is available for £799. Other compact cameras with a wide-angle lens, including the Canon Powershot G1 X with a 1.5inch sensor, available for around £479, and the Sony Cyber-shot RX100 with a 1inch sensor available for around £479. The Nikon Coolpix A offers a large APS-C sized sensor with a wide-angle Nikon lens, in a compact pocketable body with Digital SLR like controls and options that will be familiar to anyone who's used Nikon Digital SLRs. 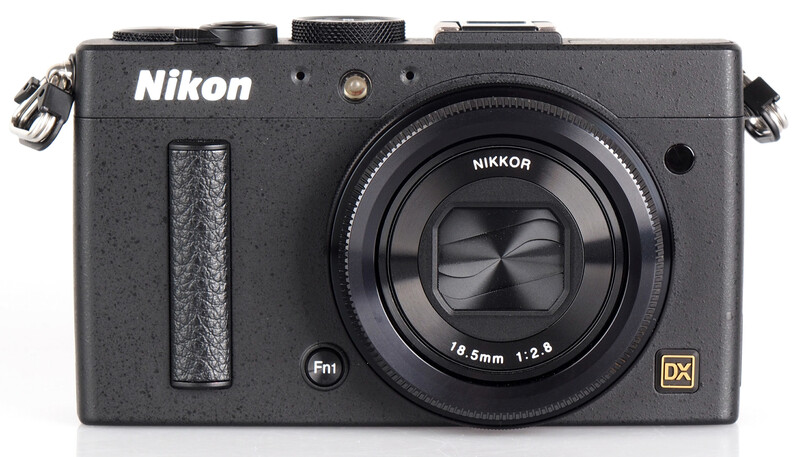 Therefore the Nikon Coolpix A would make an ideal compact camera for Nikon DSLR users, or alternatively for anyone looking for a premium compact camera with DSLR image quality and low noise. 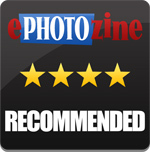 The Coolpix A is an enticing option and capable of producing very sharp images, however with a high price it could put some people off, as a number of alternatives offer high image quality in a compact camera, at a much more wallet friendly price. 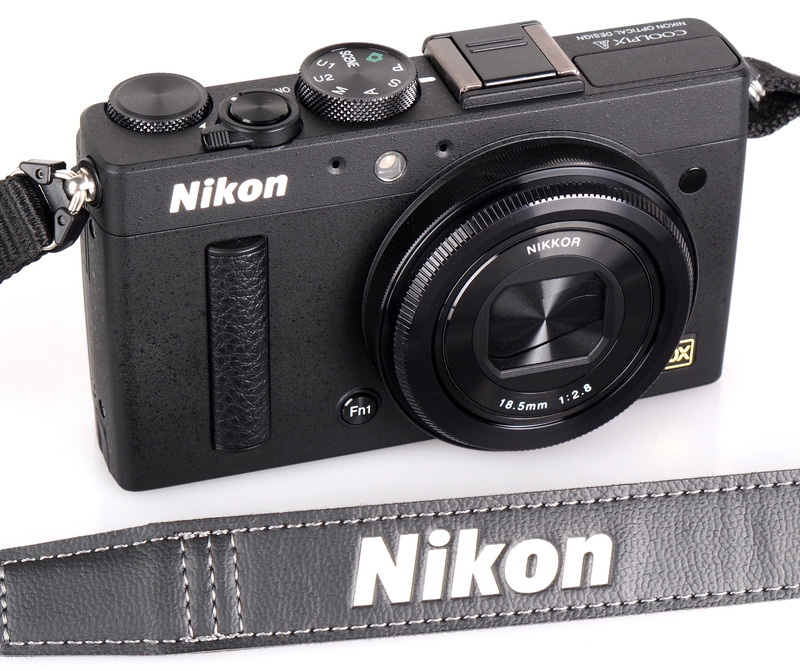 For those that value image quality and compact size above price, the Nikon Coolpix A offers some of the best image quality available in a pocketable body, although with noticeable issues such as short battery life, difficulty accessing the video mode and slow focusing. The Nikon Coolpix A takes excellent quality photos and is one of the smallest APS-C cameras available.